This is the ideal item to make your garden look good without any hassle this would also make the perfect gift for your friends and loved ones. 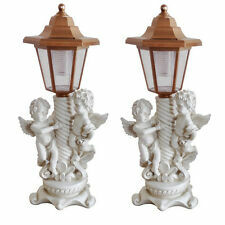 Solar Pair of Cherub Lights. Solar powered. We are one of the UK's largest distributors of Car, Caravan, Leisure & Garden Accessories. These lights have been constructed from high-quality stainless steel, making them non-corrosive and rustproof. Great Range of Products. Great Price & Value. We will always do our best to resolve any issues. Our floral garden lantern is sure to bring out the colour in your garden. 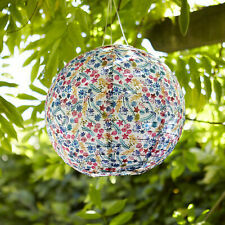 Simply hang outside ready and as the sun sets the floral lantern will illuminate from within. Floral Solar LED Garden Lantern. Smart Solar Foxglove Stake Lights Garden Ornament Decoration Flower Pink. SOLAR POWERED HANGING SHEPHERD LANTERN LIGHT. WHITE LED ONE COLOUR ONLY. AUTO ON AT NIGHT AND OFF AT DAWN (IF SWITCH IS IN 'ON' POSITION). Blumfeldt Vesta Garden Torch Oil Torch 8 Pieces 245 ml Stainless Steel. Oil reservoir in the torch head for 245 ml of lamp oil. 8 elegant torches made of brushed stainless steel open up new possiblitties for an attractive evening lighting design. Lantern Height: 19.5cm. Lantern Width/Depth: 12.5cm. Solar Security Lights. Liberty lantern LED Solar Powered Lantern. Solar power, using indoor or outdoor light. 16 Ultra Bright LED Light Bulb last up to 120,000 hours. Stays cool to the touch. No annoying batteries. Perfect for gardens, patios and courtyards alike, our solar candle lantern is a charming addition to any outdoor space. To do this, check if the product is switched OFF, and place the solar panel in direct sunlight for 16 hours. Channel Islands, Isle of Man, Isle of Scilly, Isle of Wight, Scottish Isles, Scottish Highlands and N.Ireland, Republic of Ireland. Below are the features for2pc Solar Shephard Lantern. This lovely set of Solar Lights will look simply fabulous anywhere in the garden. Beautiful Modern Solar Powered Wave Effect Glass Lantern. Brushed Stainless Steel. Creates a stunning light effect on any surface. Below are the features for2pc Solar Shephard Lantern. 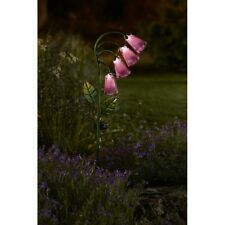 This lovely set of Solar Lights will look simply fabulous anywhere in the garden. The lights are easy to install for maximum effect around patios, decking, driveways and flowerbeds. 【IP55 Waterproof Rank】The light is waterproof, heat-resistant and cold-resistant, both for indoor and outdoor use. Hanging it anywhere you want. - Waterproof rate: IP55. - Luminosity: 30 - 40lm. Safe and Energy-Saving】Without worrying about the fire accident, it is safe enough to use in the house, even if you have young children and pets in your family. Set 10 Gardman Solar Dual Power Coach Lantern String Lights Outdoor OFFER! Gardman ( Cole & Bright) 10 Coach Light String Lights. Total Length: 3.8m 1m lead cable from solar panel to the first LED with 31cm spacing between each LED. Colour changing and white LED. RRP £19.99 per set. The POWERplus Ferret is a 3 in 1 solar candlelight. Made from high quality stainless steel, the POWERplus Ferret has it all. This solar candlelight gives a beautiful lighting effect in the dark. Or even as an attractive garden hanging lantern. Add a touch of blissful glow to your garden this season with our solar candle lantern! Simply leave in the sunshine for illumination each evening. The LED within the candle will illuminate when darkness falls for 6-8 hours. Solar power. Realistic - flickering effect amber LED Warm amber LED. - auto switch on/off at dusk/dawn. This beautiful solar powered hot air balloon would make a stunning feature in any garden this year. Hanging hot air balloon lantern. Hanging Hot Air Ballon Solar Light. theUK's leading water feature, garden and Christmas Lights specialist. This hand painted butterfly lantern will create a lovely atmosphere in your garden and will be a lovely accessory for paths and borders. Hanging lantern with a floral and beautiful butterfly design which casts a warm glow. 3 bright white LED lights will really brighten your garden up during the night. - Includes garden spike & floor bolts to fit securely in your garden or outdoors. - Colour: Black. - Looks great in any garden. This all in one solar powered lamp is perfect for most outdoor activities, whether you’re camping, hiking, fishing or at a festival. It’s soft silicone body makes it easy to fold away, keeping it portable and compact in your bag. Decorative LED table lamp with glass lampshade from Duracell. We try our best to point out major defects or problems. Parts are used and may not be up to factory specs. Beautiful water lanterns - 10 pieces by thumbs up. degradable floating lanterns! a really simple, but very effective alternative is a. Marke Thumbs Up. to conjure up pleasant and romantic atmosphere in your garden. Simply fill each with round outdoor lamp with parafin oil and light wick. Pair of Oil-Filled Stainless Steel Garden Fire Torch. Twelve bright white LED lights will really brighten your garden up during the night. - Includes garden spike & floor bolts to fit securely in your garden or outdoors. - Colour: Black. - Looks great in any garden. Light the way with the peaktop outdoor garden orange flower and hummingbird glass lantern. Charming colourful and made of glass this lantern is sure to leave an impression. Unique and stylish garden furniture and decor like gas fire pits wood burning fire pits wind spinners bird baths fountains and many more. Material: plastic / 35 LEDs, 1 Li battery Dimensions: height about 75cm, diameter about 12cm Amazing real torch atmosphere! The garden plug with earth spike creates an impressive illusion of blazing flames and creates a cozy atmosphere. Ideal for planters, flowerbeds or for lighting path boundaries. The integrated solar panel charges during the day with free solar energy and provides at dusk for atmospheric light. Light the way with the peaktop outdoor garden green dragonfly glass lantern. Charming colourful and made of glass this lantern is sure to leave an impression. Unique and stylish garden furniture and decor like gas fire pits wood burning fire pits wind spinners bird baths fountains and many more. This 12 piece assorted garden plug lantern with earth spike is a perfect addition to your garden. Solar powered lanterns available in 3 assorted colours (green, white, pink) and made from durable plastic material. Beautiful, modern LED garden torch in rattan look. Illuminates garden paths, entrance areas, beds or terraces with a warm white flickering light. -practical automatic in twilight and darkness. -solar powered, energy from sunlight. Light the way with the peaktop outdoor garden purple butterfly glass lantern. Charming colourful and made of glass this lantern is sure to leave an impression. Unique and stylish garden furniture and decor like gas fire pits wood burning fire pits wind spinners bird baths fountains and many more. Features: Hand crafted salt lamp, exquisite and cool. It can naturally ionize the air and purify the atmosphere. Easy to install and use. Exquisite figure makes the lamp a great decoration for room. Anti-radiation, air purifying, anion release, pressure relief and decoration functions. USB operation, the color of LED light will automatically change. Specifications: Size:12.5*12.5*10.5cm Material:ABS PVC . This Luxform LED Daisy solar lantern has a natural look and will make a beautiful addition to your garden. This Luxform LED Daisy solar garden lantern has a rustic, distressed look and is decorated with flower cutouts that make for a unique light effect. With the "EASYmaxx" LED torch, you now enjoy the atmospheric lights glow on the secure way. Marke EASYmaxx. Produktlinie/Modell EASYmaxx. Ausführung Fackel. Produktart Fackel. Wireless Battery. Eigenschaften LED. Part Number: GL012NDU. 2 year warranty. Vehicle Lighting. (We can mark the item as a 'gift' if requested to, but we will not declare any different amount). With the "EASYmaxx" torch lantern you can enjoy the atmospheric glow of light in the safe way. At dawn, the light turns on automatically. The solar-powered "EASYmaxx" torch lantern can be placed almost anywhere and even hang.